Enter edit mode of the portlet window and click on Add Portlet in the upper right. 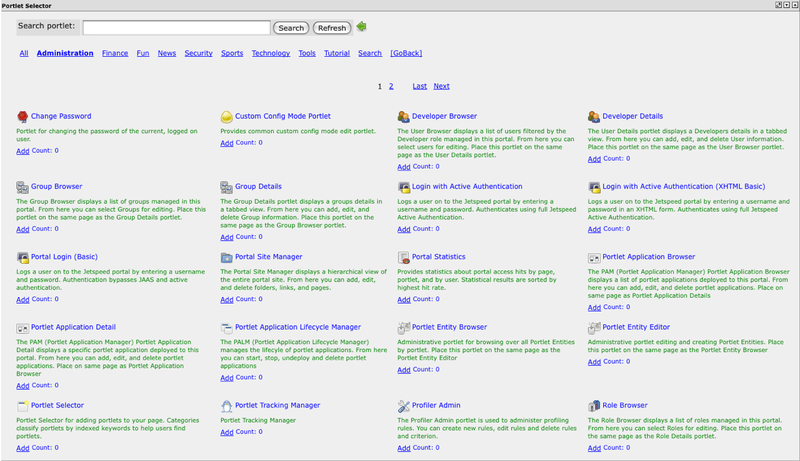 The Portlet Selector windows shows the portlets that are available for you to add. There are three main ways to locate a portlet. Navigate You may navigate through multiple pages by using the numbered links. Search A search field is provided for searching for a portlet by name. Categories Portlets are separated into clickable categories. The portlet selector displays the name of the portlet, a brief description, an Add option and a counter of how many instances of this portlet are currently running. Clicking on the Add link will increase the counter by 1, but no other visible changes will occur at this time. Clicking on the [GoBack] option or arrow will bring you to the original customization window where you can see your portlets have been added to your portlet window. If you have changed your decorator from the default decorator, you may find that your new portlets are using a different decorator rather than the decorator you are now using. You will need to return at one point to the original customization window before you see the restore option to leave the configuration area.